I don't know who made this fan-art, but I love it! So I never did get around to that Once Upon a Time rant. I was calmed enough by the season finale that I let it go… for now. We’ll see how I feel when I watch the most recent season and/or when the next season comes out. For today though I have something else in mind. Time for a trip to my childhood: Digimon. I swear I still hear people commenting on how Digimon wasn’t as good as Pokemon. I love both franchises. They are my childhood. I still enjoy both of them. 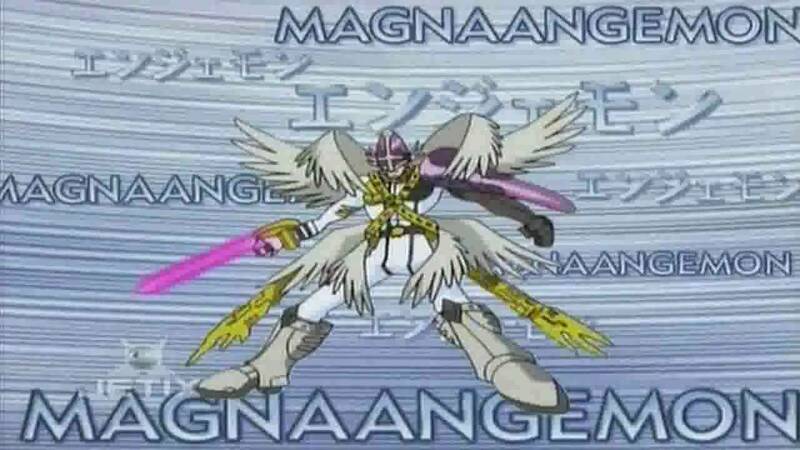 However, Digimon did not get enough credit. There are probably some things that Pokemon did wrong (I’ll touch on those, but that’s probably a discussion for another time), but there are definitely things that Digimon did right that were underappreciated. 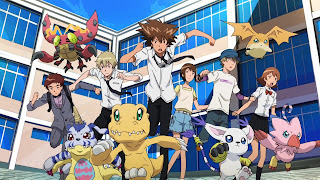 I was going to recap briefly the different seasons of Digimon for a quick refresher, but it got too long (nobody has time to read all of that). If you need a refresher, I suggest going to the Digimon Wiki. 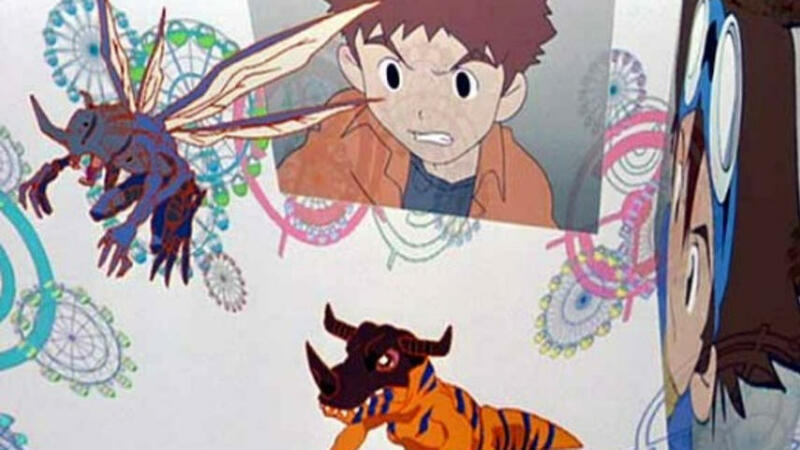 One of the biggest things that sets the Digimon and Pokemon animes apart in my mind is the writing. For a children’s show, Digimon was very well written. Using Season 1 as an example, though Tai, Sora, and Matt probably got the most screen time, all eight of the Digi-Destined children got a pretty decent amount of screen time and each of them fleshed out and each of them get character development. This is actually pretty true of each of the seasons I’ve watched. A wonderful example of the character development is Mimi. She started out as a spoiled, annoying princess, but throughout the season she softened up and realized that there was more to life than shopping and keeping up appearances. In fact, she’s the one who in some ways has the biggest heart when some of their friends start dying. We see that continue into Season 2 when she is actually quite mature in how she teaches Yolei about being kind to people. Then there’s Ken in season 2. He started out as the Digimon Emperor, but when he learned that the Digital World was real and he was hurting innocent creatures, who had real feelings, he went through a huge redemption arc, struggling to find forgiveness for the horrible things he had done. parallel world to parallel Digital World each season, it is refreshing because it’s new. One thing that Pokemon has done wrong is that they’ve stuck with Ash the whole time. Ever since the Pokemon anime started in the late 90s, Ash has been the star. His traveling companions have changed over time, but to this day, Ash looks exactly the same as the day he got Pikachu (am I to believe that almost two decades’ worth of adventures happened in less than a year?). It’s difficult to age a character on an animated show, but they could have possibly done more characters or mixed it up. That’s what my understanding is of the Pokemon manga. They have new characters each generation, like the games. Anyway, we’re not talking about Pokemon. We’re talking about Digimon. I would have preferred it if they kept their story to one world, like they did with seasons 1 and 2 and Digimon Tri (15th anniversary series), but all the same it’s refreshing to see new faces. It keeps the story from getting stale. Can we just talk for a second about how awesome this was? I have one more story-writing point: a cohesive plot. To my knowledge, the Pokemon anime doesn’t really have a cohesive plot, other than get badges, catch Pokemon, and the occasional criminal team story arc. 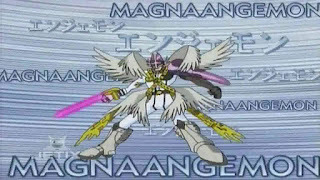 On the other hand, each Digimon season has a cohesive story. I think the best example of this is Season 2: The children fight the Digimon Emperor, who reforms and helps them fight Arukenimon and Mummymon, who are working for Oikawa, who was possessed by MaloMyotismon, who orchestrated all of it to get power over the Digital World and the Real World. One of my biggest issues with television shows is that they want to go on indefinitely. That’s what was killing LOST in their third season and that’s what’s killing Once Upon a Time right now (that’s a rant for another time). 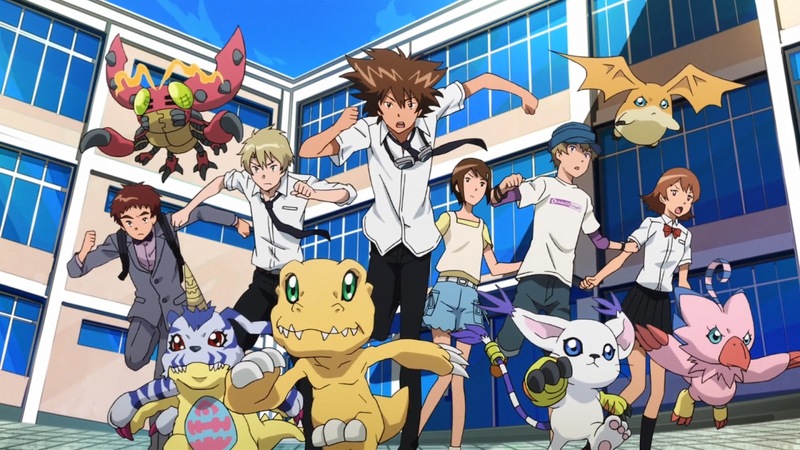 However, while some of its stories are weaker, Digimon delivers what it promises and it doesn’t go on forever. 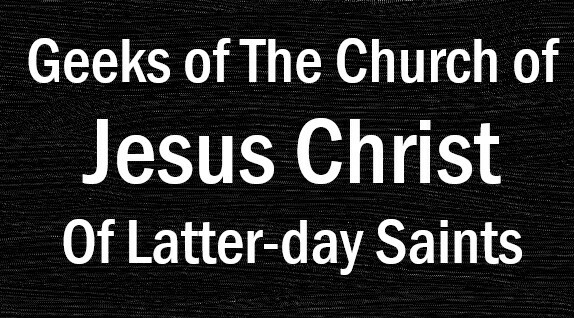 They tie up loose ends almost 100% (other than that one time…). They don’t have near as many seasons as Pokemon, but thank goodness. I’d rather have less seasons with better stories than infinite number of seasons with stories that all feel the same (how many times is Ash going to fall for Team Rocket’s disguises?). Anyway, that’s all I’ve got. I think this turned into more of a rant than I intended, but it happens. 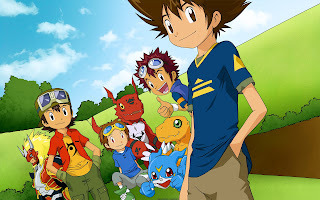 Did you watch Digimon growing up? Give me your thoughts on what you liked about Digimon and/or Pokemon. underused. Probably because he was too powerful, but still. Happy Civil War weekend! Or, as one coworker put it, happy Marvel Christmas! This was easily one of the most hyped movies of the year (the other was Batman v. Superman, but we won't talk about that one... Primarily because I haven't seen it). I'm going to do my best to do a spoiler-free removes, but seeing as different people will define a spoiler slightly differently, this is the only thing I can say 100% sure without chance of spoiler: if you enjoy the Marvel Cinematic Universe, go see this movie. The flow of he story is beautiful and you won't regret it. Now into content that some may deem spoilery. If you're super sensitive to spoilers (I'm considering anything in the promos to be non-spoilers at this point), this is your stop and I'll see you on Tuesday for a nice little rant about Once Upon a Time. For the rest of you, let's get into Civil War. Still with me? Ok. Let's get moving. Like I said earlier, the flow of the story was great. With all of the advertised character returning (Iron Man, War Machine, Vision, Scarlet Witch, Ant-Man, etc.) and with all the new heroes they were introducing (Black Panther and Spider-Man) that it would feel choppy for forced. In fact, until the last week before the movie, I wasn't sure we'd see Black Panther out of his costume. However, I was actually very impressed with how they introduced him. It flowed perfectly for the story and it actually got me excited to see his movie. Still have to wait two years for that one though. Now I have one caveat to what I just said about the flow: Spider-Man. I enjoyed seeing Tom Holland as Spider-Man and I think he did a good job, but unlike Black Panther, I felt like Peter Parker's introduction did feel forced. That being said, I'm still willing to give him a chance when his movie comes out next year. Though I am tired of Spider-Man reboots... But that's a rant for another time. I liked the inclusion of Agent Sharon Carter. Though her role in "Captain America: Winter Soldier" was somewhat limited, she was wonderful in this movie. I hope we see her again in the future. I think she'd be a wonderful addition to "Avengers: Infinity Wars" or maybe we could see her working with the CIA (which we saw that she was doing at the end of "Winter Soldier") in Wakanda in "Black Panther". If you read my second MCU post, you'll know that I mentioned General Ross in my synopsis of "The Incredible Hulk". Well, the annoying general returns and he's just as annoying and arrogant as ever. I won't get into that right now, as to avoid spoilers, but I'll just say that he did a good job of making me hate him anew. Overall, I'd recommend seeing this movie (in fact I'm seeing it two more times in the coming week). Some movies that I'd recommend watching in preparation would be "Captain America: Winter Soldier" (to get set up on Bucky), "Avengers: Age of Ultron" (to get some backstory on the New Avengers), and "Ant-Man" (to get his backstory). Or if you have the time, just watch the whole Marvel Cinematic Universe. I don't have the time and I'm doing it. 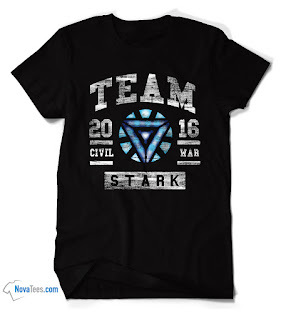 What were your thoughts on Civil War? Do you agree with my analysis? Keep the comments spoiler-free, in consideration for the poor souls who haven't seen the movie yet (I'm looking at you, Joe). That's all for now. I'll be back Tuesday with hat little rant about Once Upon a Time (unless this week's episode is extremely good). What better way to celebrate then with some new amazing Star Wars tee shirts! When last we visited Novatees they were a small starter company with a handful of amazing and unique geeky tees. Since then this company has become a significant presence at several Comic Cons, each time with a thick crowd around them reminiscent of a swarm of geeky bees. I've personally loved my Pikathor and Teenage Mutant Ninja Zombie shirts, and with as often as I've worn them they've yet to wear out like most of my shirts from other distributors, so quality and geekery! What makes this company so popular? Let's take a look! Remember to sign up for email alerts so that you can get great discounts on these fantastic tee shirts. 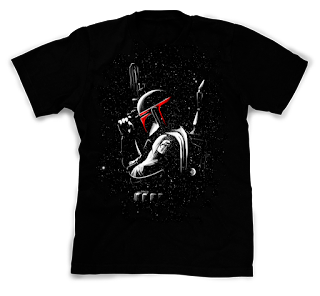 Part of the Dark Side collection, we start with the titular bounty hunter in all his bad-to-the-bone glory. Blaster in hand with just a splash of red for the visor, this is a fanboys dream, and a certain smuggler's worst nightmare. Here we get both aspects of the legendary Sith warrior. On the left the dark helmet that struck terror into the citizens of the Empire. On the right, the eyes of a father looking at his son for the first time with his own eyes. 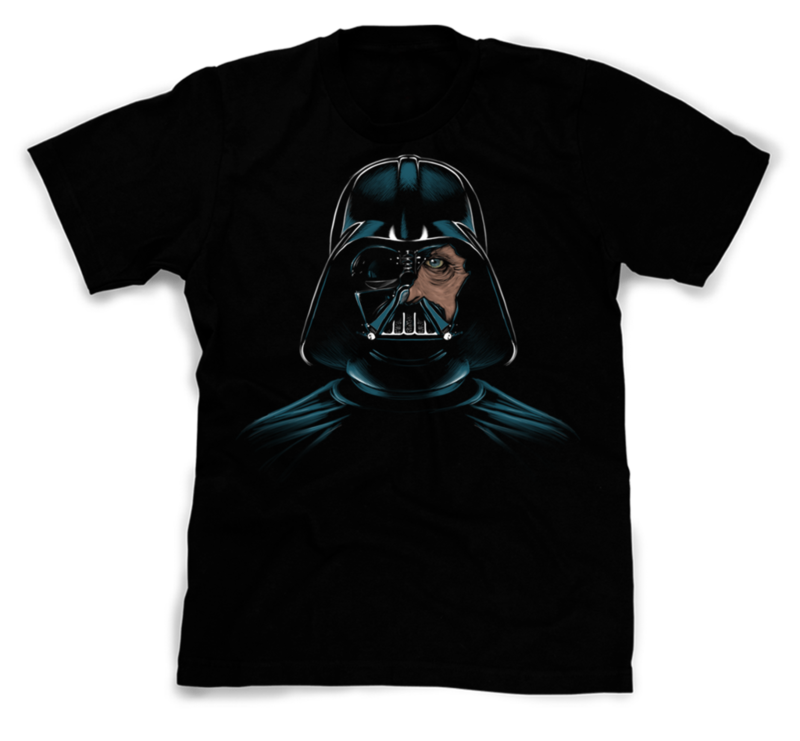 It's cool, its dark, it's moving, and it's the perfect prize for lovers of the classic Star Wars and the dark side. 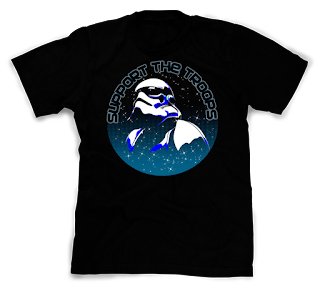 A play on the classic saying, here's another salute to the Dark Side with a First Order Stormtrooper. 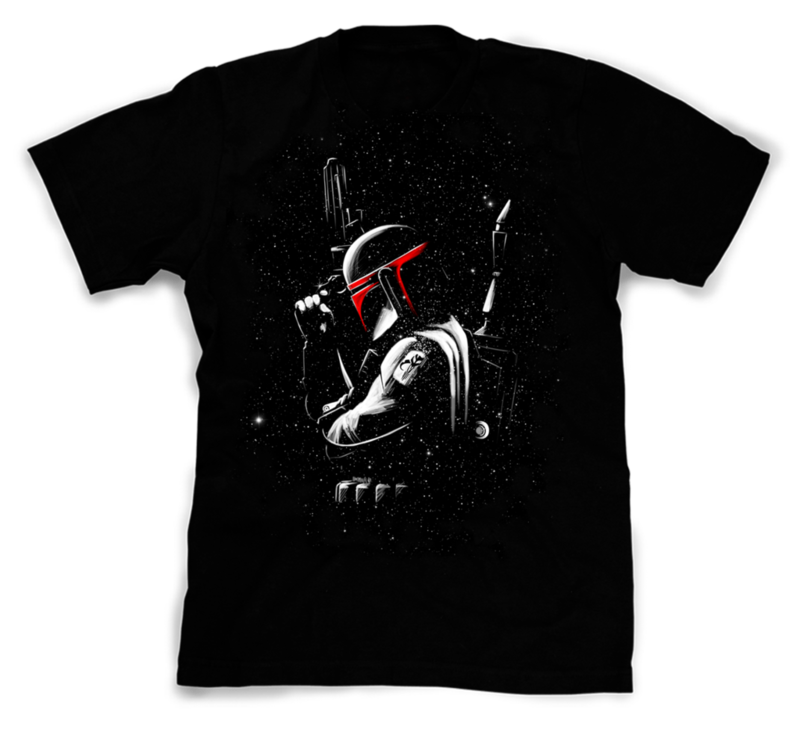 Take down the New Republic in this slick tee from The Force Awakens and maybe you won't get harassed the next time your moving illegal droids through Tattooine. Along with May the 4th this week we see the opening of Captain America: Civil War. Support your side of the battle with your team's tee. Both done in identical style, these tees make it very easy to know who to beat up after the movie. Last but not least is Deadpool sitting on the Iron Throne with Vader's helmet underneath his boot. 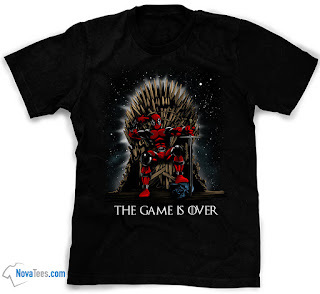 If anyone would be crazy enough to take on the Empire and Westeros and win I would bet on Deadpool. 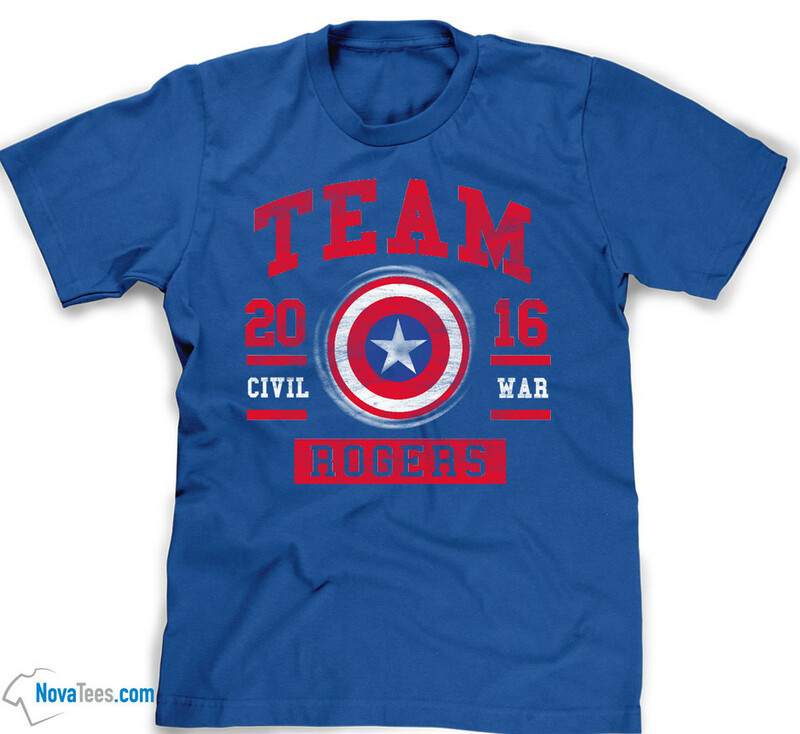 This tee shirt is hilarious and a great mash-up of three different medias. Season 4 episodes are spotty. The only complete story I was able to watch/listen to was The Moonbase. All the same, it was still a good episode. In it, the Doctor, Polly, Ben, and Jamie end up in the late 21st Century on a moonbase. 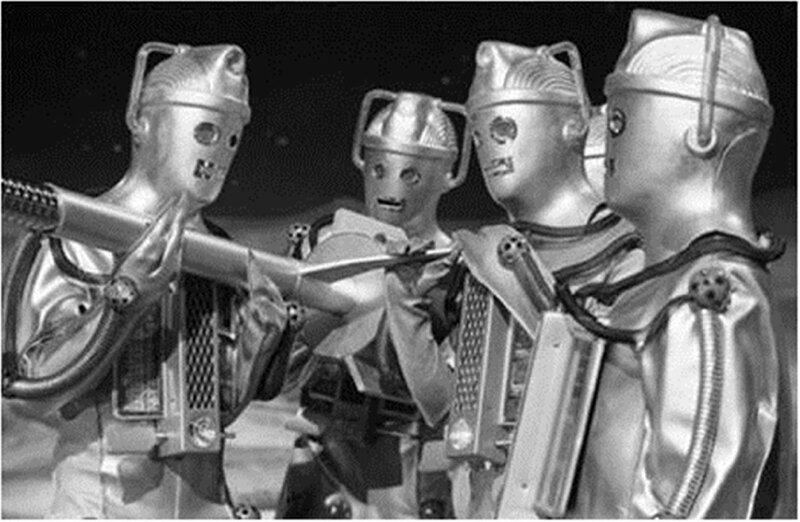 It reintroduced he Cybermen which were introduced in the First Doctor's last story. It showed one of the Cybermen's weaknesses, to a concoction of chemicals put together by Polly. This story also showed the Doctor's legitimacy to holding that title, or at least he claims he got his doctorate in Glasgow in 1888. Another Cyberman story for the second Doctor. 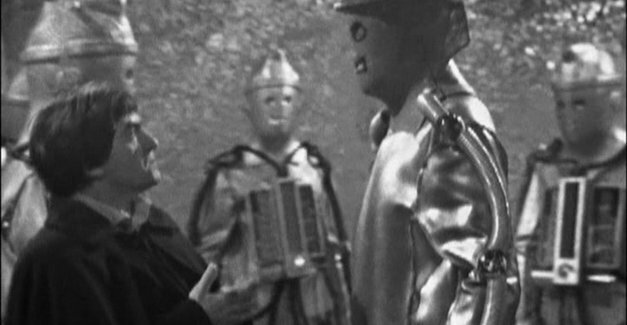 In this one the Doctor, Jamie, and Victoria end up on an archaeological expedition with a group of people who are there to excavate the tomb of the Cybermen. 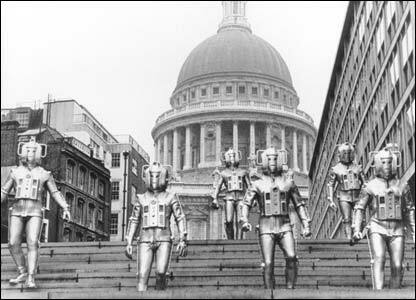 However, a couple idiots in the group want to reawaken the Cybermen and use them. How stupid can people be? Anyway, I really liked this episode for its tender moments. 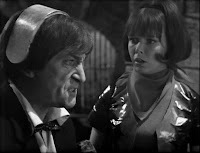 In one scene, the Doctor talks to Victoria who has just lost her family and comforts her with some words including "Our lives are different to anybody else's. That's the exciting thing! Because nobody in the universe can do what we're doing." 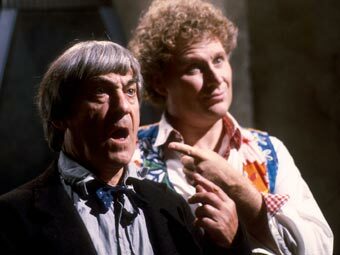 Another fun part of this episode is the interaction between the Doctor and Jamie. I'd love to see another Doctor/male companion combo like them. I was excited when this story was recovered a couple years ago, but when I watched it this year I was as unimpressed. The Doctor, Jamie, and Victoria end up in 2018 (only a couple years away and the government has fallen apart? Somehow television is mirroring reality with the upcoming election) and a group of freedom fighters get the Doctor to pose as a ruthless dictator, who is his doppelgänger. Honestly, it wasn't that bad of an episode, maybe I just have a hard time with the six-episode stories. It kind of just dragged on. 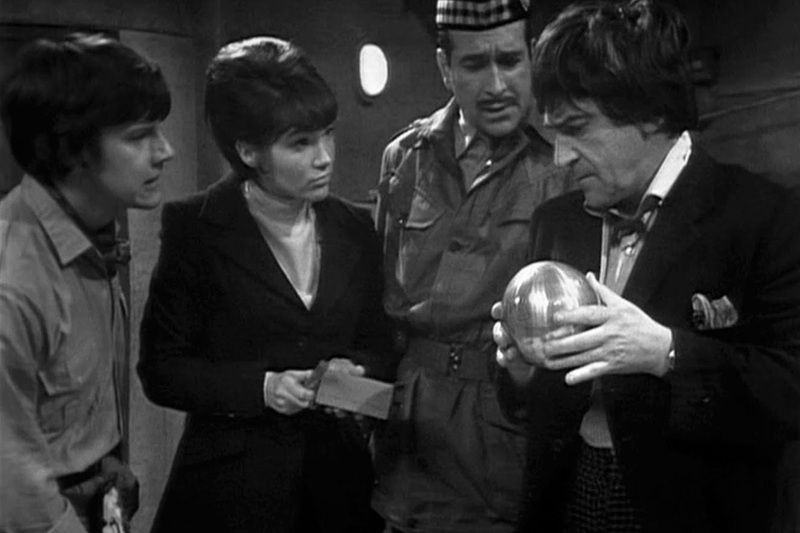 The Doctor, Jamie, and Victoria end up in a subway tunnel in the present day (well, 1968, so the present day of the time) and up against the yetis and the Great Intelligence. It also introduces Lethbridge-Stewart, who becomes an important part of the Third Doctor era. Despite seemingly defeating the Great Intelligence here, it appears again in the Eleventh Doctor era... Though the events of "The Name of the Doctor" may have happened first. It's hard to tell. meet the bad guys in "The Krotons". The Doctor, Jamie, and Zoe end up on an alien planet where the smartest and brightest end up being chosen to dwell with the overlords, the Krotons. In reality, they just get their mental energy drained and their empty shells dumped out to be destroyed. The Doctor and Zoe easily match up to their to brightest. As such they're able to take down the Krotons from the inside. I liked this story as it showed just how well Zoe matches up to the Doctor. It's nice to see someone who can match wits with the Doctor and then some. So the Doctor, Jamie, and Zoe end up against the Dominators and their Quarks. They have to get the local pacifists to stand up before their home is destroyed. I have a high tolerance for cheesy monsters in classic Doctor Who, but I couldn't even take these seriously. Also, the story was just hard to get into. first time in "The Invasion". I could have picked "The War Games" here, as it was the first episode to feature the Time Lords and Gallifrey (though it wasn't named at this point). However, I picked this one. It's a sequel of sorts to "Web of Fear", bringing Lethbridge-Stewart back (now Brigadier) to help the Doctor, Jamie, and Zoe fight the Cybermen. It formally introduced UNIT, which the Brigadier is now in charge of, which became an regular part of the ThirdDoctor era and a recurring element of Doctor Who ever since. Zoe and Isobel in "The Invasion". My favorite companion was Zoe. It was a toss up between her and Jamie, but like I said with her in "The Krotons", it's nice to see someone who can match wits and is possibly even smarter than the Doctor. She was a nice strong female companion, especially in comparison to some who came before her including Susan, Dodo, and Victoria. On that note, my least favorite companion is Victoria. She didn't really do anything except scream and freak out. Some of it could be considered trauma because of what happened to her family, but it didn't make for good entertainment. Essentially since not a lot of development was shown. The whole time she was there she seemed to be the same. That's all for now. 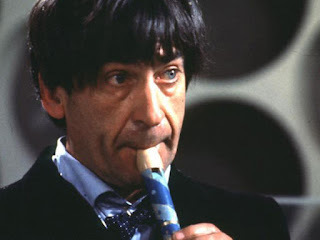 Next Doctor Who post coming in a few weeks. 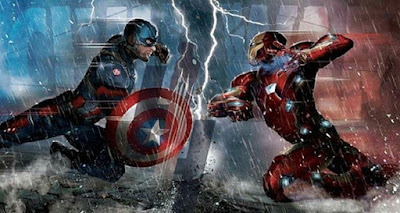 Next week, expect a review of Captain America Civil War. I haven't decided whether to include spoilers or not. multi-Doctor story, including "The Two Doctors".